Compact size for space restricted areas. For use where maximum volume air flow is required. TRIENS Signeture series poly urethane braid hose. 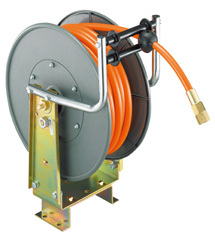 Reels come complete with urethane braid inlet hose, ball stop and complete mounting hardware. Guide Arms adjust to wall, floor and overhead positions. TRIENS' quick repair outlet fitting. SHR-450P U PU NPT1/2"M 7/16"
[11.0] 50.0 203 NPT1/2"M 3.2 17"
• Read the manual thoroughly and use it properly. • The actual product color may differ. • Product specifications are subject to change for improvements without notice. • These products are for indoor use only.